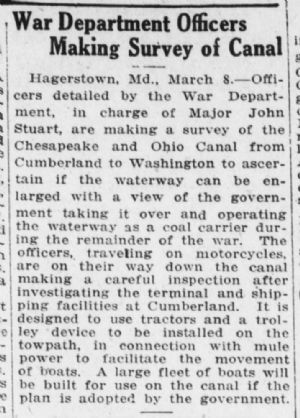 —Officers detailed by the War Department, in charge of Major John Stuart, are making a survey of the Chesapeake and Ohio Canal from Cumberland to Washington to ascertain if the waterway can be enlarged with a view of the government taking it over and operating the waterway as a coal carrier during the remainder of the war. The officers, traveling on motorcycles, are on their way down the canal making a careful inspection after investigating the terminal and shipping facilities at Cumberland. It is designed to use tractors and a trolley device to be installed on the towpath, in connection with mule power to facilitate the movement of boats. A large fleet of boats will be built for use on the canal if the plan is adopted by the government.